Since being reunited in early August Miranda and I had done Istanbul proud, despite it not being the most auspicious start to our joint cycling adventure. 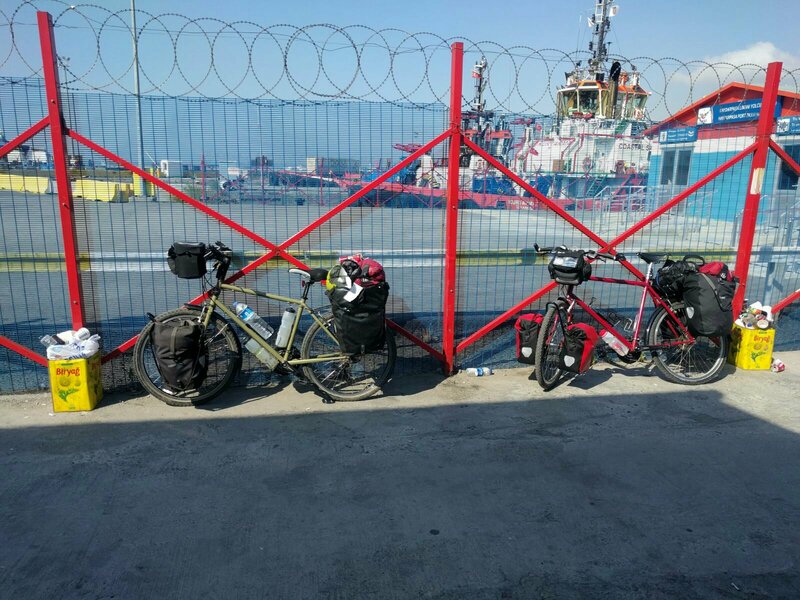 My bike spent days as an in-patient at Bisiklet Gezgini, where its genius mechanic fixed two serious and expensive mechanicals, then on our first ride together – along the glorious cycle lane that skirts the coast of the Marmara Sea – Miranda’s pedals fell off. We talked, laughed, sang, giggled, roared and shrieked our way through the gossip you miss with three months of separation. 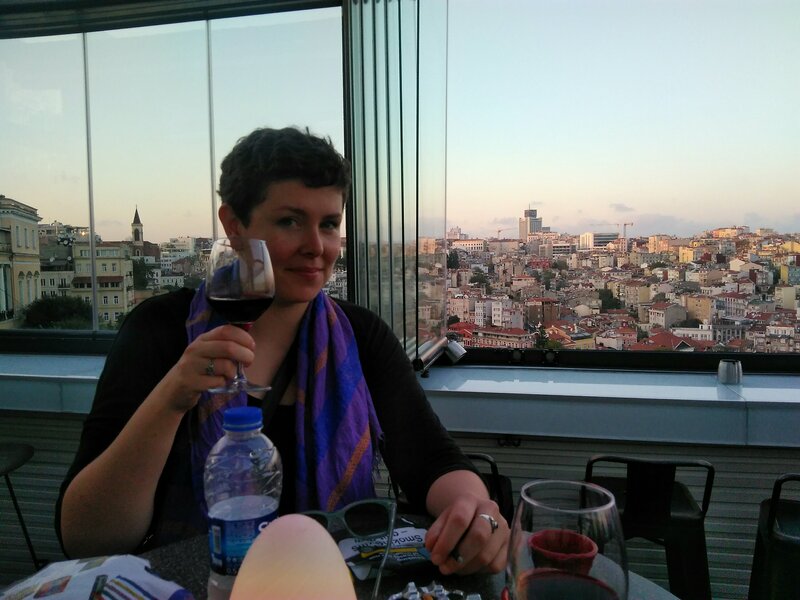 We nosed around the Grand Bazaar, padded barefoot through the Blue Mosque, sat at a rooftop bar and watched the sun dip into the Black Sea while the call to prayer rose up from both sides of the Bosphorus. And we decided to skip the rest of Turkey and go to the Ukraine. You would not have to be Captain Cook to observe that this is an unusual way to reach Georgia from Turkey: “You’re going the wrong way,” my dad observed. It came about when, one hot Istanbul afternoon, having drunk enough Turkish coffee to kill a gorilla, Miranda and I went over the relief map of the country. Our last-second decision to try to cycle the Pamir Highway into Kazakhstan meant that time was suddenly an issue – if we wanted to reach the mountains before winter and its -40 degree nights set in – and throwing our bikes on public transport would at some point become a reality. 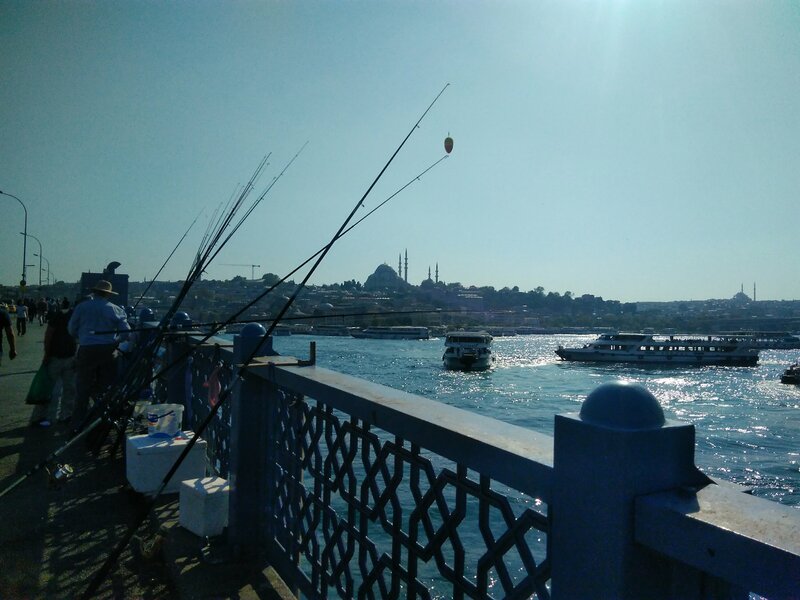 But we had planned to cycle at least to Ankara to give Miranda a chance to see Turkey, acclimatise to the staggering heat and the heavy bike. Sunrise a few days later found us heaving our heavy bikes across Istanbul to a port on the Asian side, nursing the hangovers we’d earned celebrating our last night in Turkey and a new conundrum: the boat we’d planned to get from Ukraine to Poti in Georgia had disappeared from the schedule. 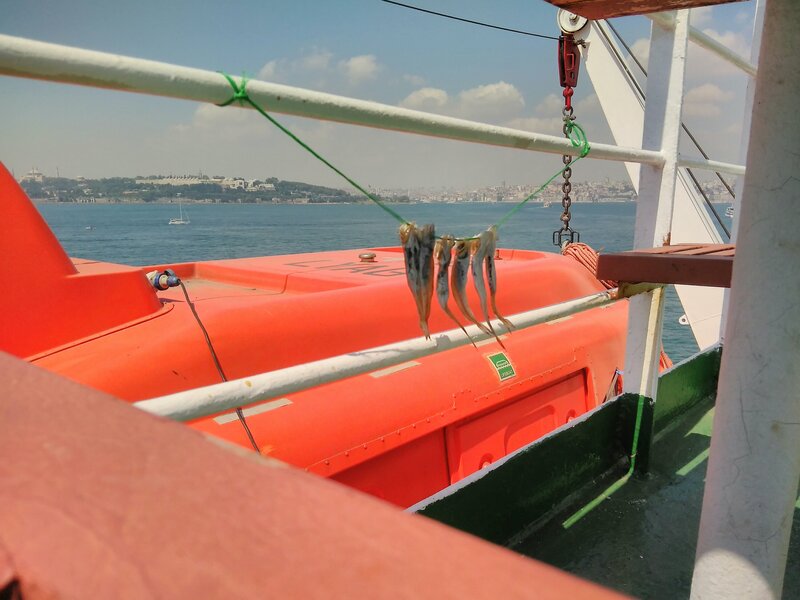 We boarded the boat across the Black Sea without a way out, but with a sense of optimism. 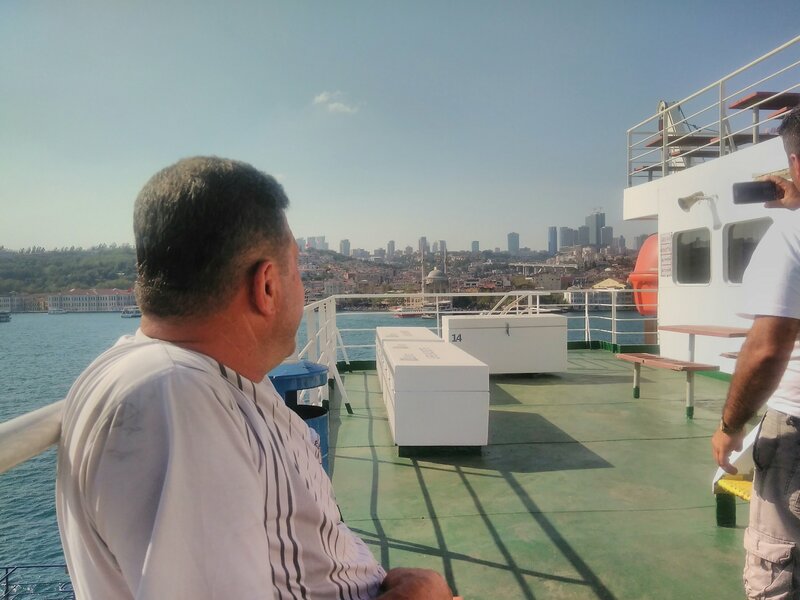 Our ship was primarily used for transporting HGVs across the Black Sea, and how we had joked, as we sat in Istanbul eating mezze, about the voyage ahead. Perhaps there would be vodka! Maybe Ukrainian HGV drivers would take a shine to us! Perhaps the food would all be pickled! “HE’S OUTSIDE AGAIN” I hissed to Miranda, motioning for her to duck out of sight of our porthole. We were hiding from a Ukrainian HGV driver who had materialised next to me when I had been reading on deck and, with an elegant dance of his eyebrows, indicated that he would like to feed me grapes. He later found our cabin and would occasionally pop up outside the window with either a bottle of whiskey or a bunch of grapes. To an extent, the voyage was everything we had dreamed. As we sat over lunch – which was delicious and generous – I watched as an HGV driver the spitting image of Sean Connery glanced around, retrieved a bottle of vodka from underneath his seat, and poured quadruple shots into the teacups of all the men on his table. He saw me looking, winked, and I leaned over to Miranda and whispered, “I think everyone on this boat might be drunk”. We precipitated two international incidents before we left Turkey. 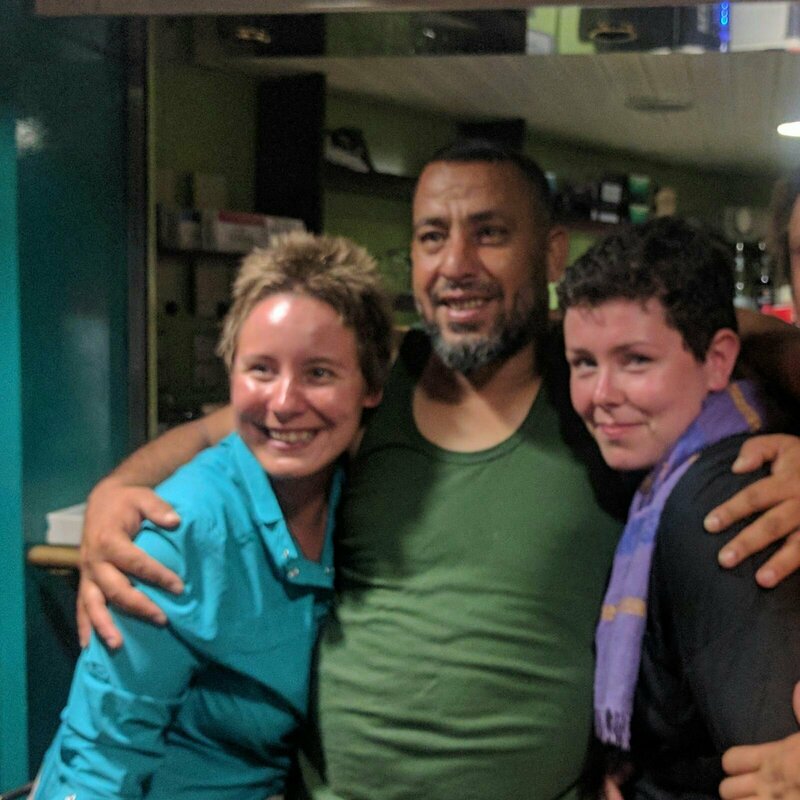 I was asleep on the deck in the sun when a member of the crew stormed our cabin to tell Miranda the Turkish police were looking for me; I was still clutching my cup of tea when, following a hair-raising ride across the port in the back of a police car, a puzzled passport officer told me there was nothing wrong with my Turkish visa and I was welcome to leave. 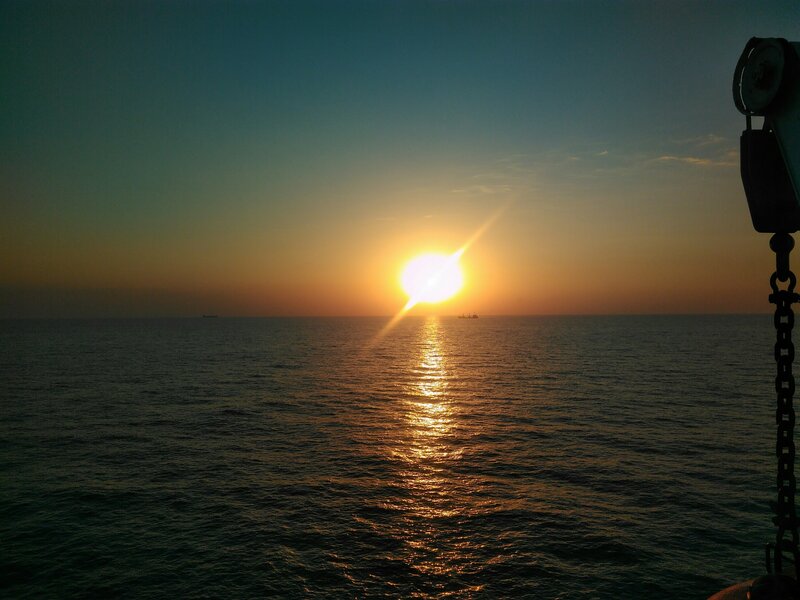 A few hours later I was asleep on the deck in the sun and missed the summons for the passport check, rescued form another encounter with the police by the Russian truck driver who raced up the stairs to find me before I could be ejected from the boat again. We sat in our cabin that evening wondering what to do. Common sense said to stay locked in our room. But it takes more than the unwanted advances of a lorry driver brandishing grapes to keep an Irishwoman and an Englishwoman from the duty free bar, so we steeled ourselves, descended to the Captain’s Bar, perched on stools and ordered two glasses of red wine. This, I’m afraid, started a bit of a trend. Soon we were surrounded by truck drivers – Ukrainian, Russian, Turkish, Khazakstani, Azerbaijani – who were also suddenly interested in drinking red wine, but insisted on doing it in shots. As you might imagine, this meant that they became tremendously good fun. We were marshalled into more selfies than Benedict Cumberbatch at a sci-fi convention; we were embraced; we were bought more red wine; we were invited to parties and dinners and parties and dinners in other countries and who-knows-what else. A fight broke out and a Ukrainian tried to woo Miranda by explaining he had an Irish friend called Eoin and they hunted wild boar together. Out on deck I decided it was time to break out my only Russian phrase: Nostrovia! I shouted. “Nostrovia!” shouted the Russian truck driver we were standing with; he downed his wine, he downed my wine, he downed Miranda’s wine, and then he threw all three wine glasses in the sea. Miranda and I decided it was time to retire. We arrived in Ukraine to discover that a boat to Georgia did still operate, but not for three days. So we did what anyone would do in that situation and decided to nip over the border to Moldova: the weather was slightly cooler than Turkey, the relief was kinder, and the border sliced in half a national park that looked ideal for wild camping. We had travelled hundreds of kilometres in the wrong direction, but it looked like we finally had our acclimatisation ride. Miranda has two phobias of relevance to long distance cycle touring: wild dogs and snakes. As we recovered from being chased by a pack of wild dogs beside a river out of which a large snake had emerged I said to Miranda, “it’s not always like this”. My first week on the road I had trundled easily along the Rhine, between Holland and Germany, and the biggest risk I faced was the Monastic breweries running low on stock. But transposed suddenly from western Ireland to southern Ukraine Miranda endured a baptism of potholes, enormous lorries kicking up dust into the humid summer air, hills, and a communication barrier I hadn’t encountered in almost four months on the road. We had a series of important phrases and words – “water”, our names, where we were from – written in Russian on our phones. But most of the people we met couldn’t read. 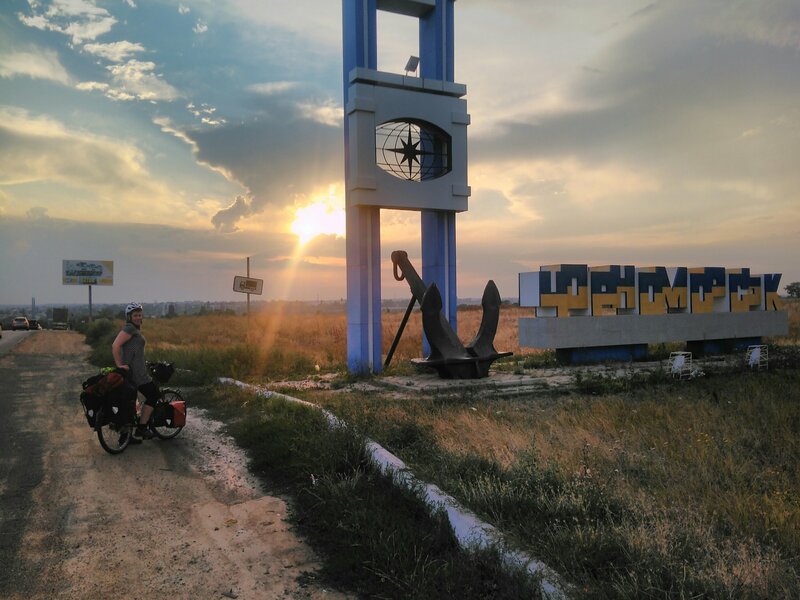 We arrived back at the port in Ukraine covered in dust, mosquito bites, chain oil and bruises. 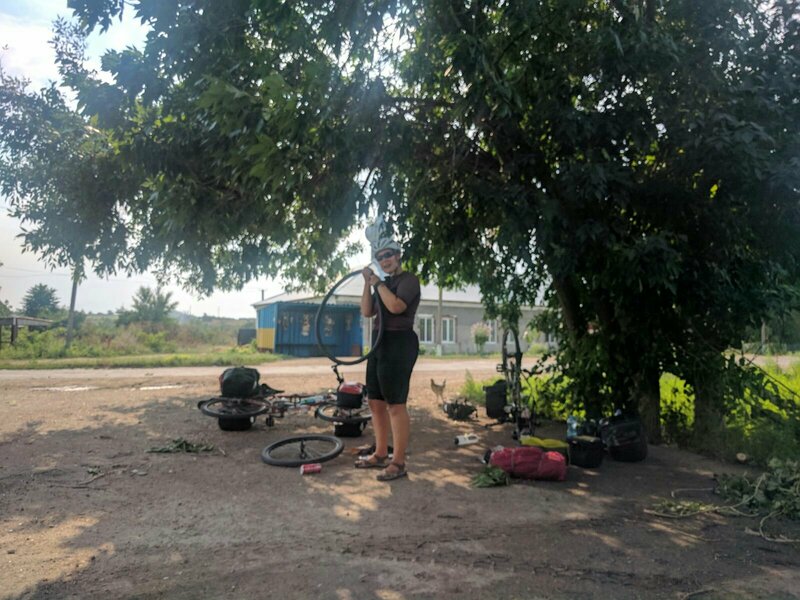 We had been intimidated by a campsite cow; broken the stove; I had punctured my Thermarest and had my first tyre puncture in more than 4000km; I had incorrectly re-fitted my rear pannier rack, trapped the chain and obliterated my top gear. But we were in hysterics, sitting outside our motel in Cheronomosk. The boat to Georgia was due to leave in a couple of hours, and we were looking forward to two nights at sea. With the amnesia for hardship and calamity that can only happen when you’re travelling with your best friend, we wondered if Sean Connery would be there drinking vodka with his breakfast; and we vowed to have nothing to do with truckers wielding grapes. Now it seems that you have managed to find a way to bypass the Caucuses and all that exciting history and go straight to Batumi. Its a nice place in an ex-Soviet fashion but you will definitely like Georgia. Good luck and keep going. Glad to see that you are making good progress and have not lost your gift for improvisation. YOUR BOAT HAD A BAR??!! Oh yes my friends, and it only served champagne. Not even joking.